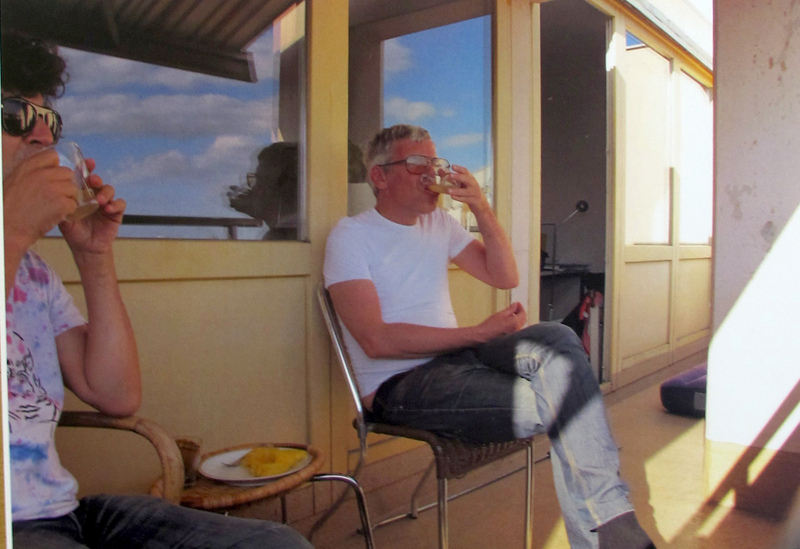 Karl Holmsvuist on his Berlin penthouse terrace reflecting the sentence PROPER TEA IS THEFT by Karl Marx. 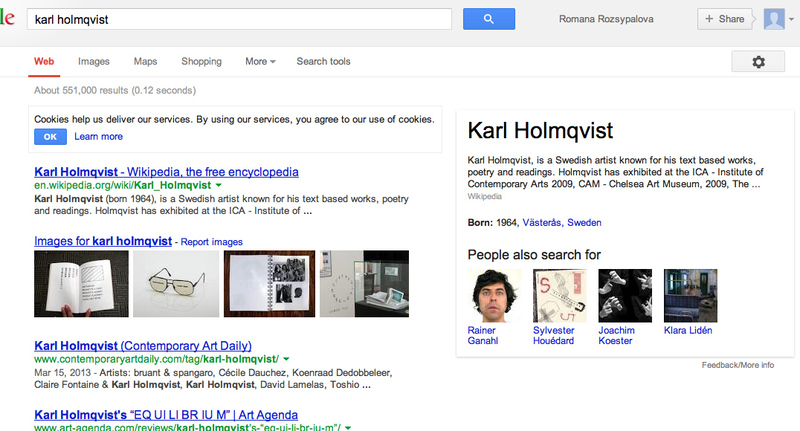 Karl Holmsqvist is a Berlin based magnificent poet, artist and a friend of mine as well as a beloved voice in the art world. 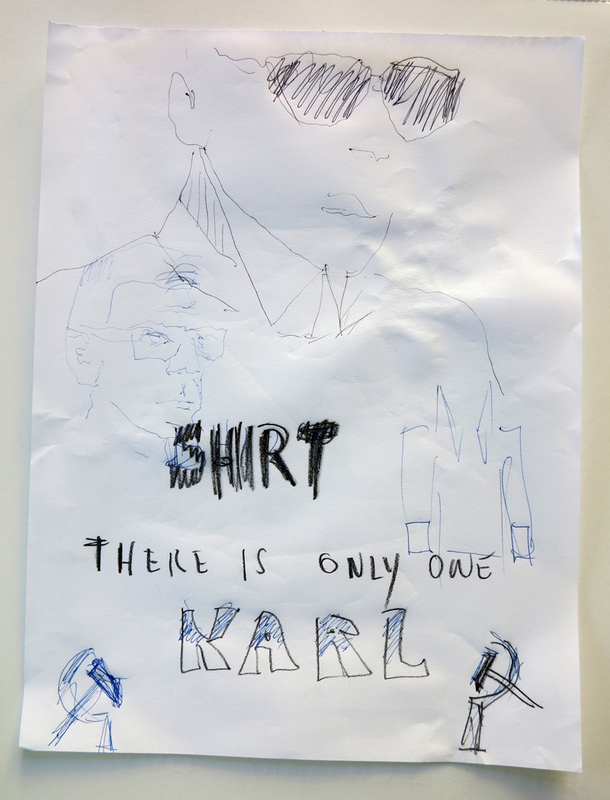 During a dinner in Berlin, I suddenly realized that I’ve got three Karls on my mind: Karl Marx, Karl Lagerfeld and Karl sitting next to me on the table. 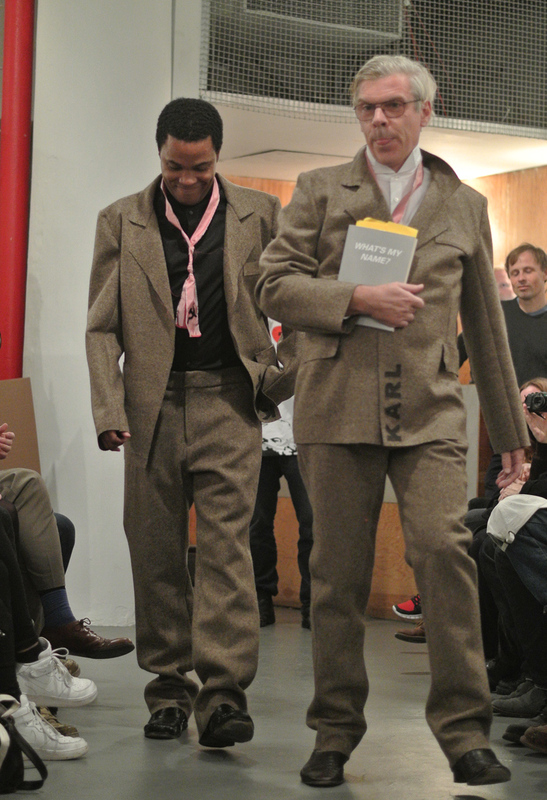 The claim, there is only one Karl, inspired me that very night to a set of works that brought yet another German legion on my mind: Joseph Beuys and his felt suit. 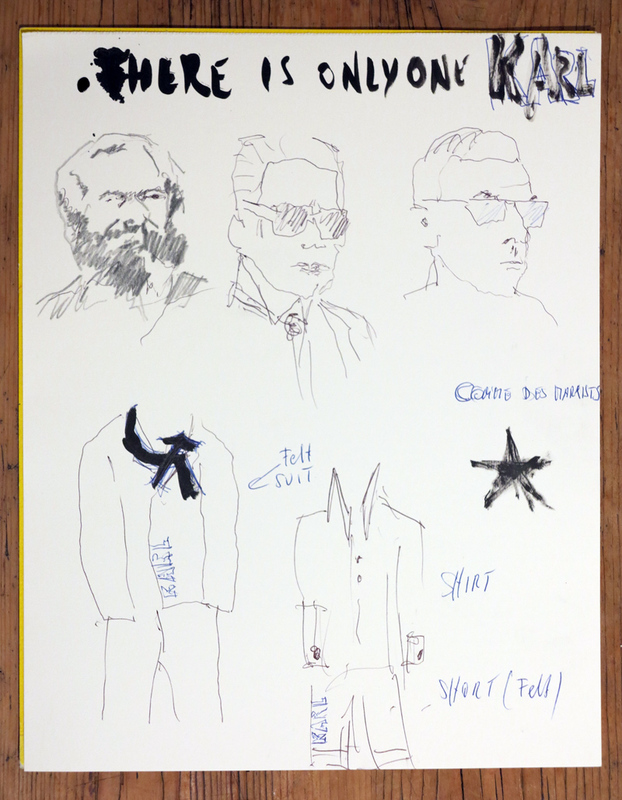 In Germany, everybody in the art world shares the feeling, there is only Beuys who was entitled to use felt for his art works. 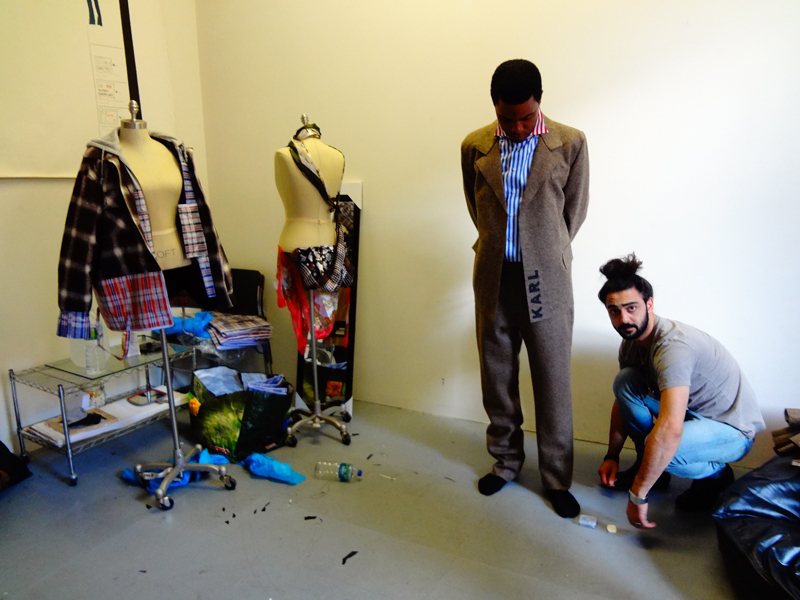 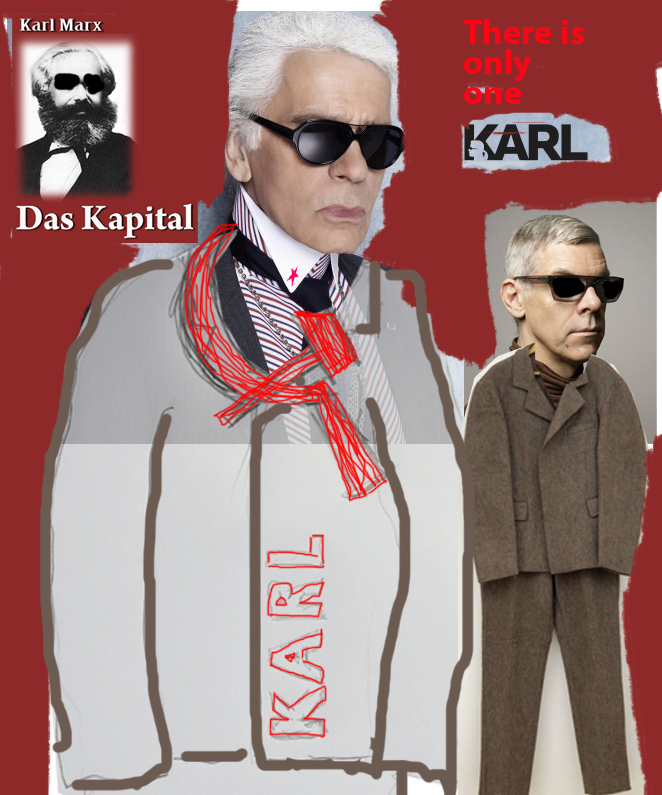 Therefore, I wanted to dress Karl in a Beuys suit and label the outfit There is only one Karl. 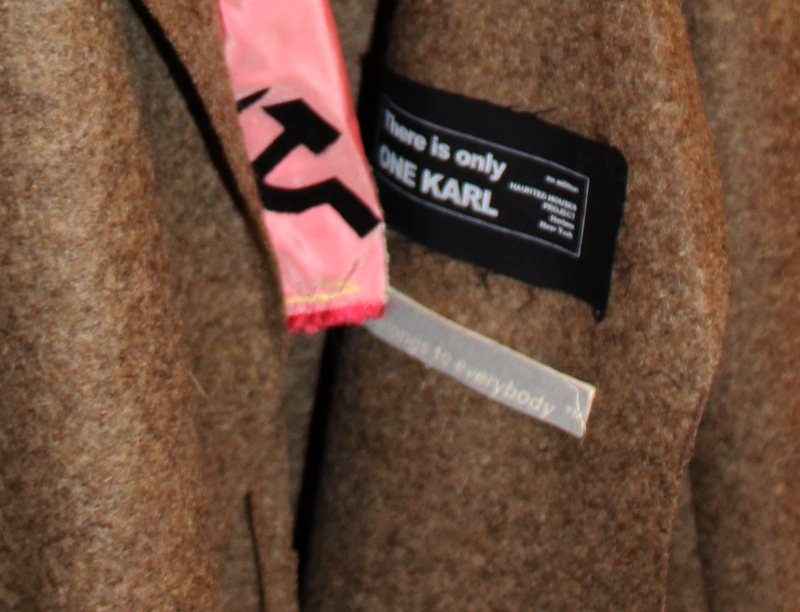 In a quasi-socialist gesture I added as a second label FELT belongs to everybody™ trying to break the proprietary intellectual aspect of this quintessential German material since the majority of high quality felt is still produced there. 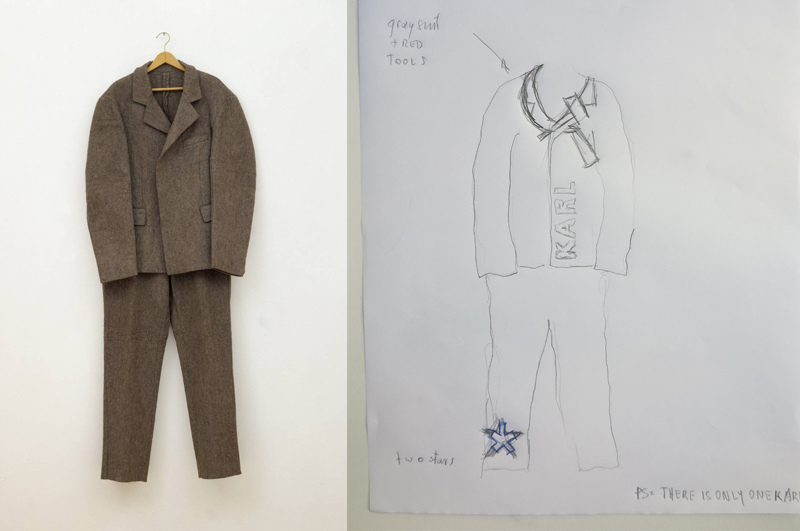 Beuys’s iconic felt suit features a special label that indicates even twice which edition out of 100, the year 1970 as well the gallery René Block, Berlin which produced it. 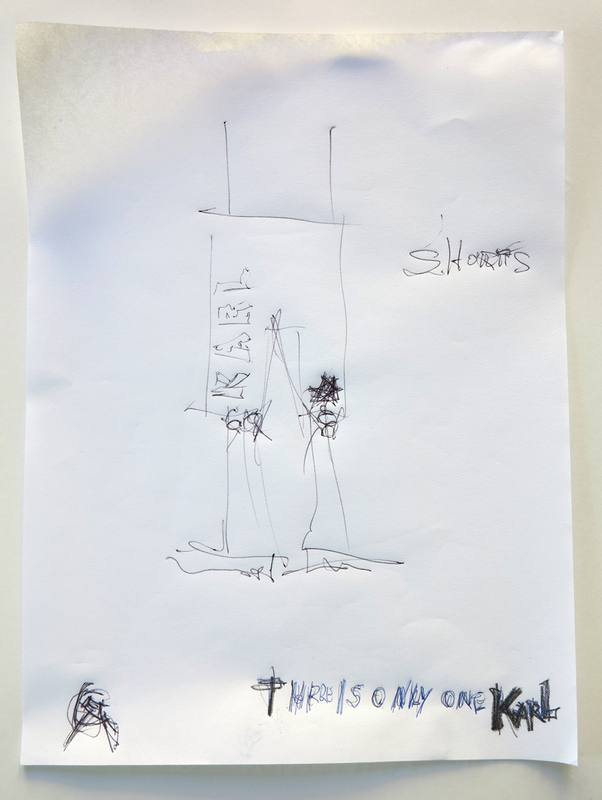 I took the same format up, made it unique and mentioned Haunted Houses Projects, Harlem, New York as fictional producer, referring to an institution of mine which exists only as idea but reflects my location and other activities of mine in Spanish Harlem. 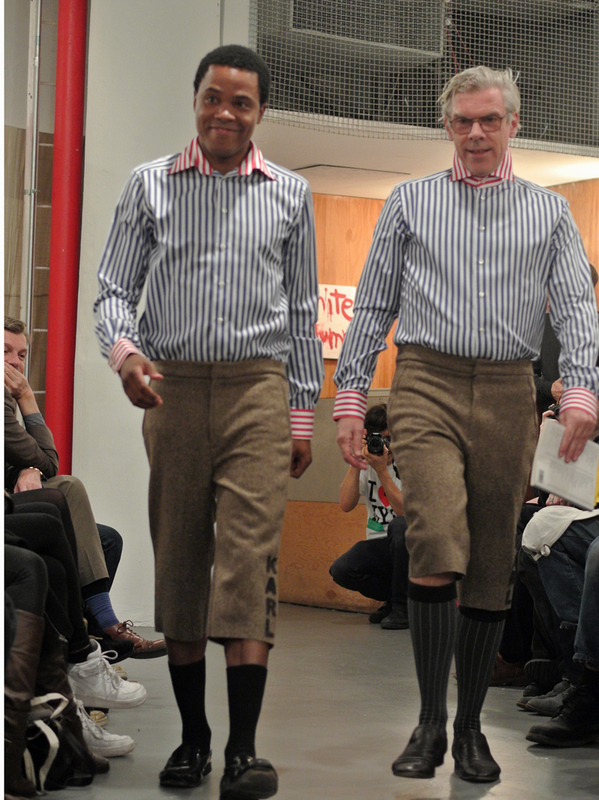 To lighten up the iconic seriousness of the German’s original outfit that can only be recognized as such when it hangs on a hanger on a wall, I opted also for a summer version with short legs. 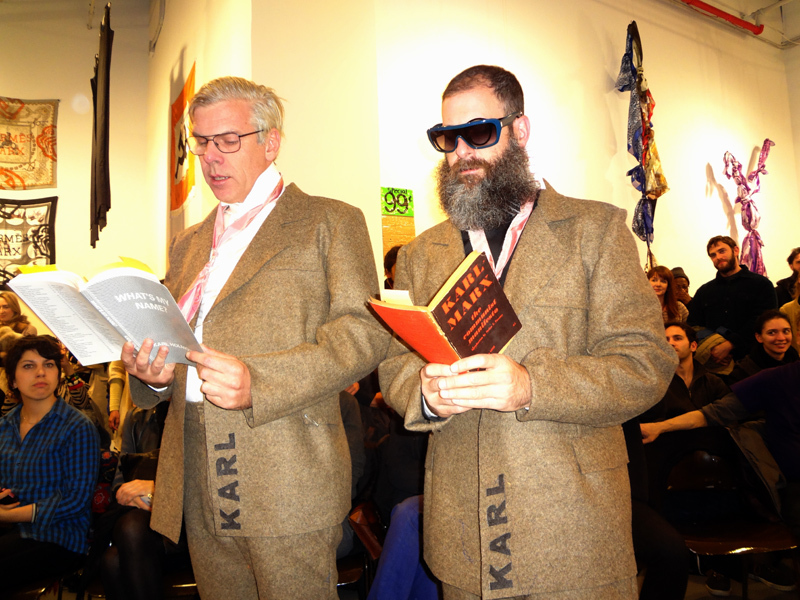 On the left front of the jackets the letters KARL were added. 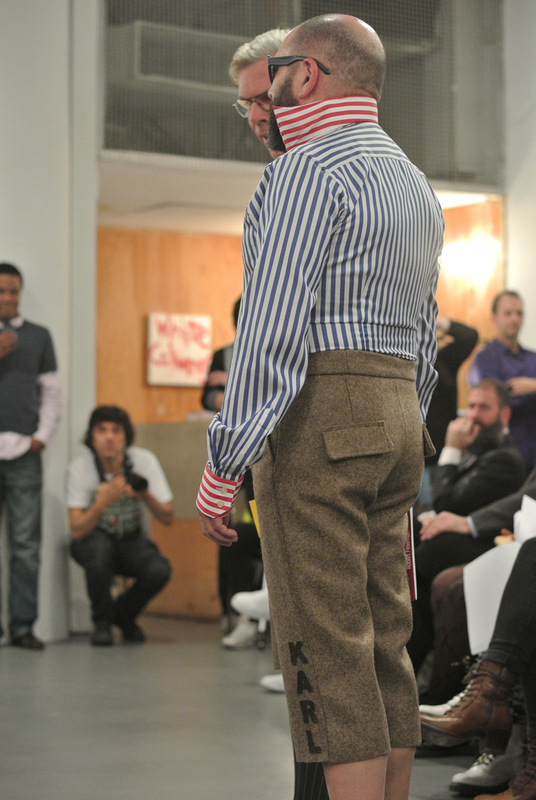 The way, Beuys’s felt suit is unique, Lagerfeld is known for his eccentric way of wearing specially cut shirts he only wears himself featuring very high collars to cover up all the bodily stuff that finally might hinder his very successful bit for immortality. 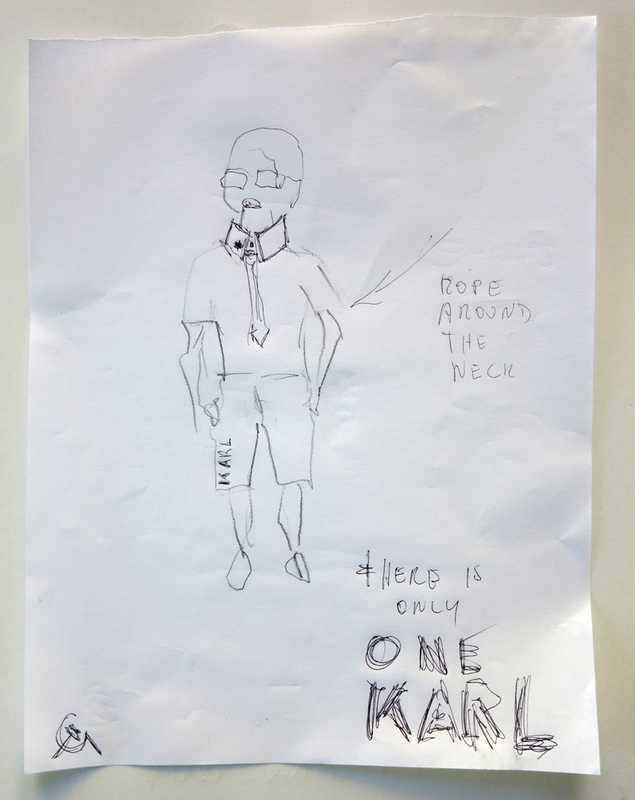 My synthetic silk red necktie got freely interpreted, embellished with a small hammer & sickle and renamed after what any tie actually is: Rope around your neck. 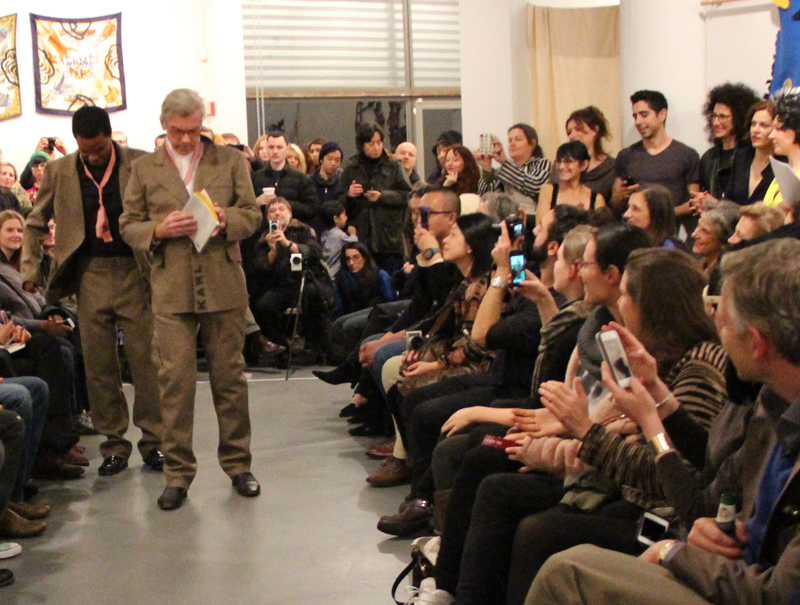 The main condition for this set of works was that Karl Holmsqvist would come to New York and present it himself and he did come from Berlin. 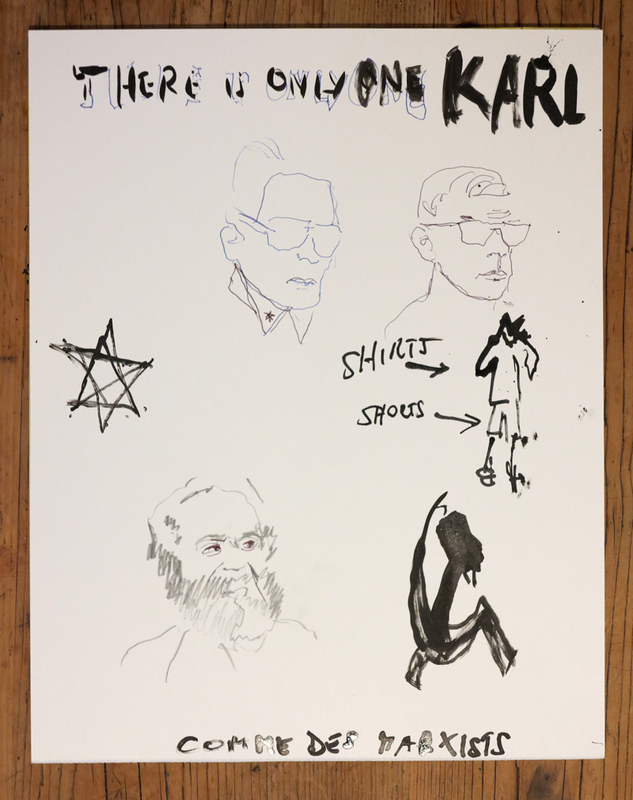 Given the title, There is only one Karl, I realized I have to have at least always a second poet for the show. 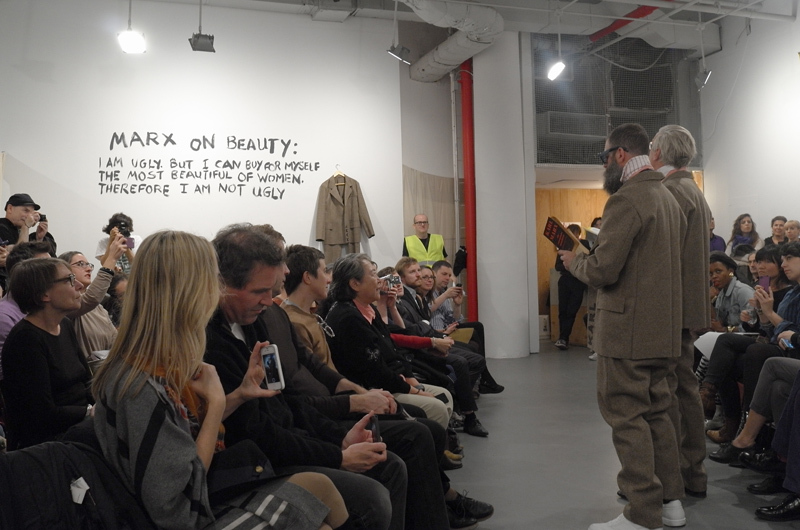 Finally, I was able to pair Holsqvist with the “Moma’s poet laureat” Kenneth Goldsmith, the poet Robert Fitterman, winner of the 2000 “New American poetry award” and the writer and art critic Peter Duhon. 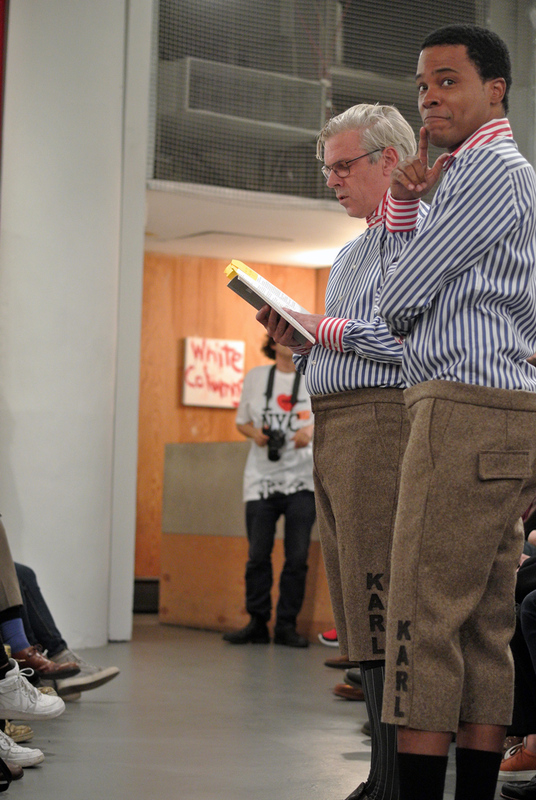 In four different outfits, including two long pants and two short ones, we were able to present all poets several times during each of the two nights with all poets reading short texts or poems of their own choice. 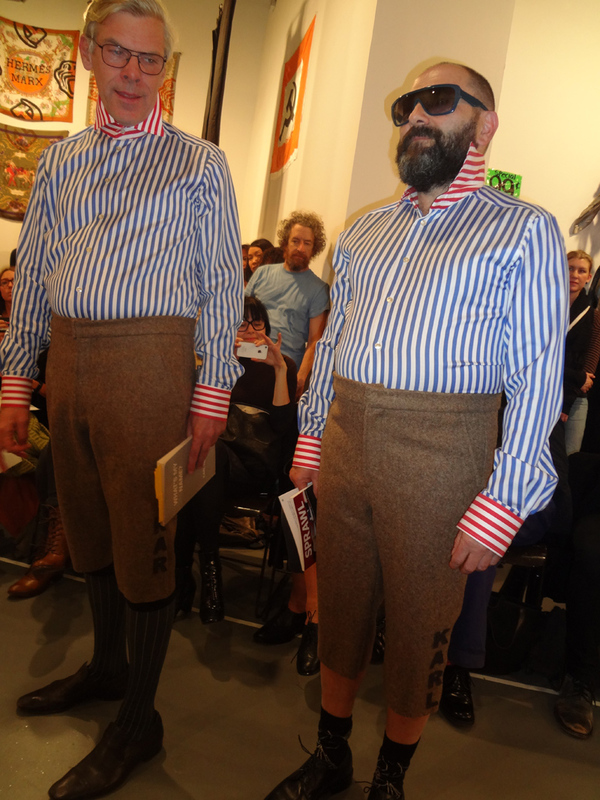 The irony has it, Kenneth Goldsmith customarily dresses in COMME des GARÇON suits, coats and shirts fancying a contemporary form of dandyism which gave my There is only one Karl styling yet another spin since the overall context for my endeavors is COMME des MARXISTS. 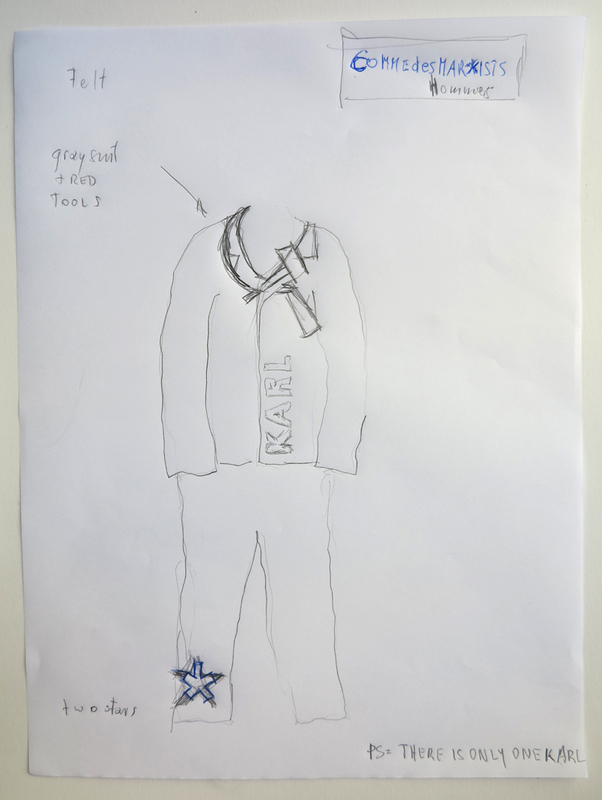 Since I could only afford to production of two jackets, the second suit which hang as a reference piece during the entire evening performance on the wall would be taken down for the additional performer and hang up again thereafter.